Precision stainless steel load cell designed for high temperature operation. Flanged guide chute provided to direct material onto the impact plate. Dust confining mild steel enclosure with two access panels. Airslide adapter available to provide interface with customer’s existing material delivery system. There are two applications in cement plants where flow meters have found acceptance for many years. The first application is for feeding raw meal to the kiln, and the second is the measurement of oversize material flow returning to a mill from the separator. This is a critical application requiring a calibration accuracy better than 1% in order to provide totalization of the material fed to the kiln. The control aspect is also important because feed errors can affect cement quality and refractory life. Belt weigh feeders were commonly used for this application before flow meters were developed. As kiln capacity increased, weigh feeders became very large, dusty, and expensive. Flow meters are compact and relatively inexpensive when compared to weigh feeders and their overall installed cost. Since weigh feeders have a much higher inherent accuracy than flow meters, it is necessary to include a material test capability for the flow meter installation. 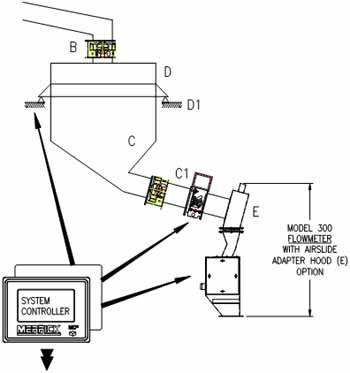 The standard configuration is shown in Figure 1 and includes a level bin with load cells. This system is used to perform material tests during normal operation, without interrupting the kiln operation. All modern plants have automated grinding controls. The separator returns flow is a primary reference for this automation. Mill efficiency is determined by obtaining the lowest KW/ton energy cost. When a grinding mill has been optimized, the grinding point is maintained by feeding a constant amount of material into the mill. The total material being fed into the mill is the sum of the new feed plus the returns. Therefore, if you can measure the returns, you can control the new feed to maintain the total feed to the mill as constant. This is a good application for flow meters as the material is granular and flows consistently, with no tendency to stick. The calibration accuracy is not critical and totalization is not required. The only required output from the flow meter is a repeatable analog rate signal. 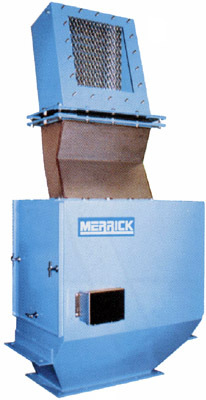 A main application for the Merrick Model 300 Flow Meter is feeding raw meal to the kiln. 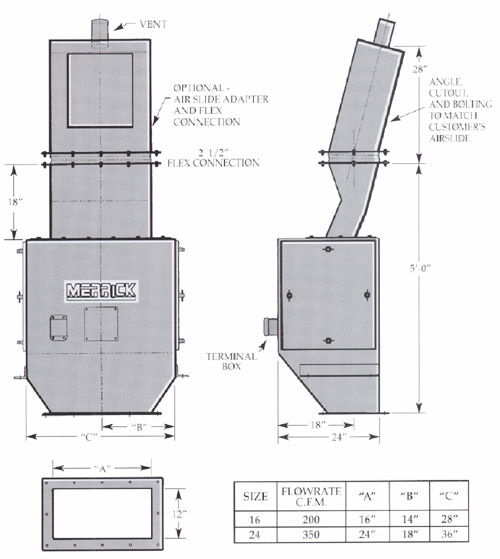 For this critical application, the flow meter can be connected to the load cells on the “Level Bin” to provide a calibration function which guarantees the accuracy of the feed rate to set point. C1. Airslide and valves by others. Motorized flow control valves must have linear characteristic and slew rate of 20 seconds. D. Level Bin sized to provide 15 – 20 minutes retention time at maximum flow.D1. Load Cells Three (3) precision strain gauge load cells supplied by MERRICK.